There are two possibilities. One is that it is just a quirk of the plants. 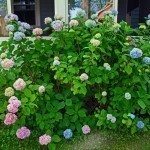 Some hydrangea, even within a specific variety bloom more evenly than others. 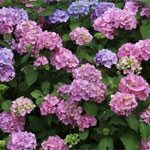 Some varieties are just prone to uneven blooming and are even prized for this quality. The other is that they plants are not getting quite enough water. 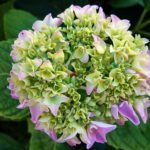 A sightly water stressed plant will sacrifice its blooms first, often rushing them through the blooming process, which results in less than stellar blossoms. I would try increasing the water to the plants. Make sure you are giving them good, deep waterings to encourage them to grow deep roots so they will be less susceptible to water stress.